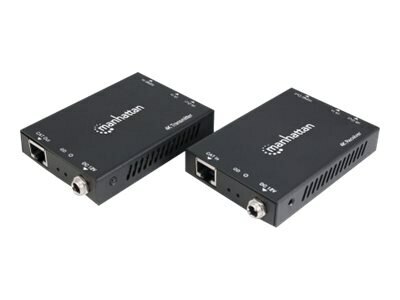 The Manhattan 4K HDMI over Ethernet Extender Kit is the ideal solution for connecting virtually any digital HDMI source (PlayStation, Xbox, Blu-ray player, satellite receiver, digital recorder, etc.) to an HD display or projector up to 60 m (196 ft.) away — UHD up to 50 m (165 ft.) — via a single Ethernet cable. The Kit provides reliable 1080p or 4K resolution video and multichannel audio transmission over longer distances than HDMI cables alone. The transmitter and receiver modules have additional 3.5 mm ports for bi-directional Infrared (IR) that allows for the control of the devices at either location.